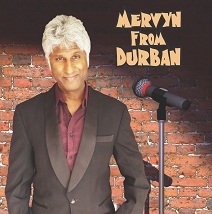 Back by popular demand for an encore at Sibaya in June is Mervyn from Durban. After sell-out shows in April, he returns to share his experiences of growing up in Durban on June 10, 2018. He will take his audience on his laugh-a-minute journey, from childhood through to being the funny adult he is now, with stories and anecdotes that will resonate with Durbanites. No-one is excluded from Mervyn’s amusing content. He has jokes about everyone from honourable members of parliament to parastatals, the municipality, service delivery and people who, according to him, are not too bright. Narcissist celebrities, gold diggers, sugar daddies and fake people are also his subjects in this crazy, comical session. His show takes place at the iZulu Theatre, Sibiya, at 15h00 on June 10, 2018. Tickets R100 available through Computicket, Shoprite/Checkers or Sibaya Box Office. The show is rated PG 13.